The headlines supported my point of view: A high protein breakfast helped overweight teens avoid food cravings later in the day. But, as so often is the case, the news was much less interesting than it was made to appear. First, it was a very small study: Ten overweight teens in the habit of skipping breakfast were paid to eat breakfast. For a week, they ate a “normal” protein breakfast each morning and were tested on the 7th day. After a week’s break from breakfast, they ate a “high” protein diet for a week and were again tested. The testing was simple. Shortly before lunch, while in an MRI machine, they were shown pictures of animals, tempting foods, and blurry images. The machine registered which areas of their brain lit up. Based on the brain images, a determination was made about whether or not the girls would snack more later in the day. Leaving aside that the study is too small to be used to predict behavior, I am not convinced that we know enough about how our various brain regions respond to stimuli to draw definitive conclusions about what these girls actually would or would not do if faced with real food. Wouldn’t it have been more interesting and enlightening to offer them a choice of healthy and unhealthy lunches and watch what they actually ate? Or simply measure how much they ate of whatever was offered? And what did the girls eat for breakfast? The “normal” breakfast contained 18 grams of protein in the form of cereal (crispy squares, rice or wheat) and milk. The researchers did not specify whole grain so no doubt refined grains and chemicals were in the cereals offered. The high protein breakfast came in at 50 grams of protein (twice what WHO says we need and about what the FDA recommends for a full day) in the form of Belgian waffles made from cottage cheese, liquid egg whites, margarine, sugar-free maple syrup, and more. Both groups also drank 8 ounces of water with their breakfasts. Knowledge is a good thing. I am fine with studying how the brain lights up when shown pictures of food (even though I am not especially interested in those studies). But why not design nutritional studies with a bit more depth? Perhaps compare the effect of a classic American breakfast of refined grain cereal and milk with a non-dairy, non-grain breakfast richer in high quality protein, fruits, and vegetables and without artificial maple syrup and margarine? Then follow up by monitoring what the teens actually eat once freed from the MRI machine. 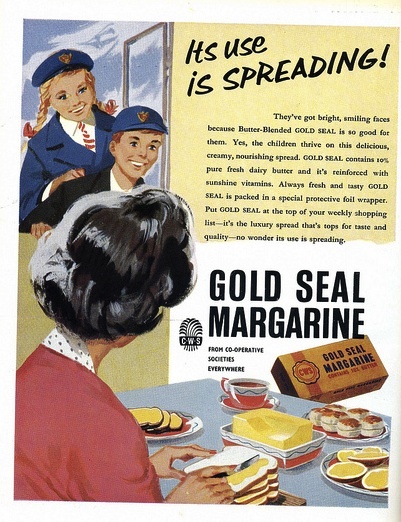 The photo: CWS Gold Seal Margarine. Co-op magazine advert, 1960, Creative commons, some rights reserved Felix O aka sludgegulper. This entry was posted in Uncategorized and tagged breakfast, high protein breakfast, nutrition study, obesity, teens. Bookmark the permalink. I agree with you wholeheartedly that it was a crap study, but I think they are on to something with their hypothesis, they just need someone who actually knows something about nutrition to formulate a decent test breakfast (the scientists I’ve known aren’t exactly known for their good eating habits). Anyway, in my own life I have found that a breakfast with generous amounts of protein and fat at breakfast do indeed turn off my appetite for the rest of the day until dinnertime, so I end up with two largish meals instead of 3 medium ones, and come up with 200-300 fewer calories in the day without feeling deprived at all. I also feel like my hormones balance out better and just feel more normal with that kind of food spacing. I agree that a protein rich breakfast has a big effect on food choices over a day. I do prefer a few more meals than that in a day though.